Australia imports more ICT equipment from China than the rest of the world combined - why doesn't the rest of the industry follow? 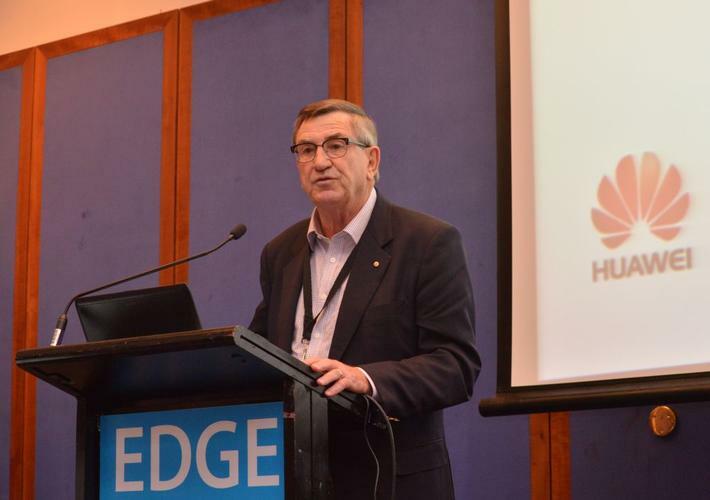 Huawei Australia’s chairman, retired Rear Admiral John Lord, in keeping with the leadership theme of the conference, brought his experience to bear and discussed how Australian businesses can better approach the Asian market. Huawei Australia is the first, and only, region to have its own board. Lord, who was a Rear Admiral in the Australian Navy, discussed in front of a packed house the difference between good management, and leadership. “Good management can result in tight and effective organisations, high efficiency and clearly measurable benefits. In an organisation good management alone will work in the short term – perhaps for this year’s dividend or the next, but won't have longevity,” he said. “In leadership there are a few naturals, but most of us have to learn how to be a good leader – or the best we can be. There are a few core skills that one should be familiar with such as communication methods, environment settings, people wants and priorities, and an understanding of leadership styles. Particularly in the military, being a good leader is not always about being popular, but being consistent, he said. The difference between the military and business, is that if you get it wrong it will not only cost dollars and outcomes, but could result in the loss of lives. Huawei, grew from a $US5000 company in 1987 selling switchboard in rural China, to a $US47 billion company today, even as it was virtually known internationally as late as the year 2000. It now rivals Ericsson as the largest end to end ICT vendor in the world, is the only Chinese company recognised in the world’s leading 100 brands by recognition; and now sits inside the Fortune top 300 companies. “One of the key drivers of me accepting the invitation to form Huawei’s first regional independent Board back in early 2011 was the leadership, vision, drive and employee dedication I saw in Huawei. I saw this through discussions with the founder, Ren Zhenfei, the Bill Gates of China; I experienced it when meeting employees at all levels. I observed it as I looked at the Company’s growth, its commitment to R&D and innovation, and its drive to continually learn and improve,” Lord said. Lord discussed Huawei’s history and how it has focused its growth in countries that were mostly ignored by the big players, such as in the Middle East, Africa and South America. The company has also made R&D a key focus. “If you want to be the best in our business, you have to be totally committed to R&D and innovation. Ren, a keen US devotee to their business practices, observed that global leaders were committed to R&D. In the late 1990s he did likewise, committing the company to spend 10-14 per cent each year of its revenue to R&D. This figure has never dropped, even in tough financial times, and over the past few years has remained around 12% - around $US5.5 billion in 2014,” he said. Lord believes that there is still a problem in Australia with how the Chinese market is perceived – we focus too much on what can we sell to them rather than what benefits can they bring to us in Australia and New Zealand. “A few years ago, statistics showed than two thirds of the world's middle class were located in the western world; primarily the US and Europe. It is now generally accepted that by 2025, two thirds of the world’s middle class will reside in Asia; not just China, but India and Indonesia also. So yes, from an exporter’s perspective, there are many good reasons to be Asia focused for growth in the future,” he said. Australia is limiting itself by not accepting new companies from non traditional partner or innovative countries, and that a relationship based on trust needs to be built up. “Your iPad is manufactured in China. As an example, Huawei like all its competitors uses a global supply chain. Our components comprise 30 per cent from the USA, 23 per cent from Taiwan, 13 per cent from Europe and with China about 30 per cent, most of which is casing materials. There is becoming no such thing as a product manufactured in one country,” he said. Much like the acceptance of Japan as a global manufacturing superpower, in the 1960s it was seen as a backwater, Toyota was seen as a cheap car, and Seiko watches as Swatch knock offs. Not to mention that Australia is now looking to buy Japanese submarines. “It is unbeknownst to most Australians that telecommunications plays such an important role in our trade relationship with China. In 2014, Australia imported $US9.1 billion worth of telecom equipment and parts from around the world, number four in our list of goods imports. In 2012 53 per cent of our telecommunications imports came from China. We have imported more ICT equipment from China than the rest of the world combined,” he said. Read more ​Forget how to be a great leader - Why are you a leader in the first place? Lord believes that the benefits of trade with China are still poorly understood – they will form the basis of our prosperity in the future. He believes Australia and New Zealand are missing big opportunities to be involved in this global supply chain, by supplying our highly skilled, tech savvy workforces. “We need to attract and get leading innovative companies in the ICT industries to establish R&D relationships with our SMEs and Universities, and ultimately build R&D centres in Australia so we can grow and retain some of the brilliant intellectual brains that depart our shores every year to work in Silicon Valley, China and globally. "We are small countries, and while we may punch above our weight in innovative discoveries, we can never match it with large entities bringing and sharing their innovation and R&D with us in Australia. With these facilities on home soil, we can join GSCs, we can value add, and truly become part of the cutting edge in new technologies,” he said. Geographically, sitting on Asia’s doorstop is a massive market opportunity going missing. “ It is important we cash in on our like time zones, our shared region status, rather than have these large growing economies focusing more on the larger economies of the US and Europe. We do need to build relationships and punch above our weight if we are to get our share of this growing economic development on our doorstep,” he said.